Tools « The SQL Dude! There are many of you SQL Developers and wizards out there still working on legacy DTS packages. Of course, we cannot live without SSMS (SQL Management Studio) and thus try to integrate the legacy SQL 2000 DTS Designer into it. But, life is not that easy and the entire procedure to get DTS Designer/Runtime working on SQL 2005/2008/R2 Management studio is quite cumbersome. While I was working on setting this up myself, learnt quite a few tricks which I what this blog is going to talk about. At the end of this you should be able to both import, design and execute legacy SQL 2000 DTS packages (not SSIS) on a machine that has SQL 2005+ Management Studio installed. Read on and let free your picassonian designer skills with DTS packages. Read the above article to get an understanding of what is possible and what is not (Don’t start/install anything yet) as this process can be quite tricky. My friends @ SQLServerFAQ have a nice post on this which is also something I would recommend reading here. 1. You would need to install a few additional components, so please download the following packages and keep them ready. 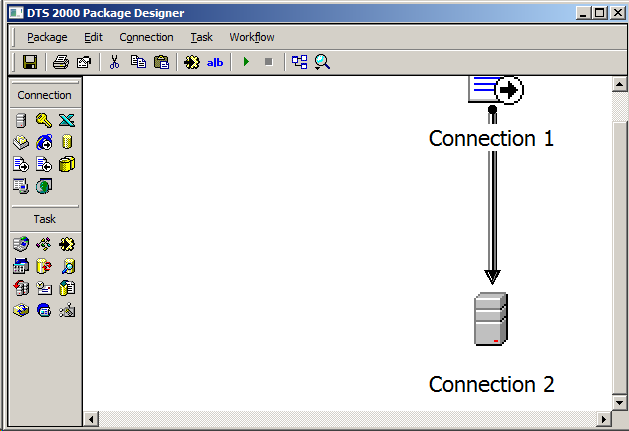 Download the package SQLServer2005_BC.msi. If you have a 64-bit machine, then you would need the x64 package because the x86 package will not let you install and you will get this error. c. Make sure when you had installed Management Studio that you have chosen “Management Tools – Complete” during the setup for SQL 2008. 3. Now, you need to edit the system PATH to ensure that the path for “C:\Program Files (x86)\Microsoft SQL Server\80\Tools\Binn\” comes before the ..\90\Tools or ..\100\Tools folders. 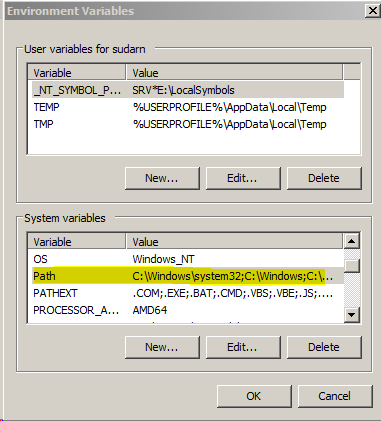 You can do this by going to My Computer –> Properties –> Advanced –> Environment Variables and editing the value for "PATH” as shown below. Here is a sample path value from my working machine. 4. Okay, now comes the manual part. This step is the same as given in the MSDN article. b. Copy the files, SEMSFC.RLL, SQLGUI.RLL, and SQLSVC.RLL, from the %ProgramFiles%\Microsoft SQL Server\80\Tools\Binn\Resources\ folder to the %ProgramFiles%\Microsoft SQL Server\100\Tools\Binn\VSShell\Common7\IDE\Resources\1033\ folder (for English locale). For example, for U.S. English, the lang_id subfolder will be "1033". b. Copy the files, SEMSFC.RLL, SQLGUI.RLL, and SQLSVC.RLL, from the %ProgramFiles(x86)%\Microsoft SQL Server\80\Tools\Binn\Resources\ folder to the %ProgramFiles(x86)%\Microsoft SQL Server\100\Tools\Binn\VSShell\Common7\IDE\Resources\1033\ folder (for English locale). For example, for U.S. English, the lang_id subfolder will be "1033". 5. After this is done I would suggest a reboot of the machine to ensure that if any pending file renames are present, they will be completed on a system restart. This is not mandatory, but just a suggestion. 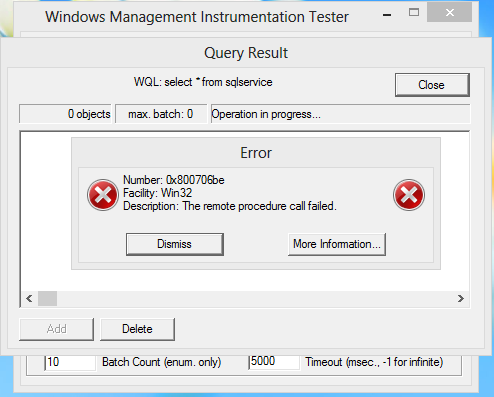 If you cannot reboot, then you need to close all instances of SSMS and re-open to test opening a DTS package. If all goes well, then when you open a SQL 2000 DTS package (test.dts), then you will see the legacy DTS designer open up as shown below. If you have faithfully followed the above procedure step-by-step then you will need to perform this additional step as well on those systems where you receive the above error. This is why I have not added this step as default since it does not occur on all systems. 1. Navigate to C:\Program Files (x86)\Microsoft SQL Server\80\Tools\Binn and see if there is a file called stardds.dll present there. 2. Note down the file version, date and size. 4. Close SQL Management Studio and re-open it and repeat the process of opening the DTS package and it should work now. 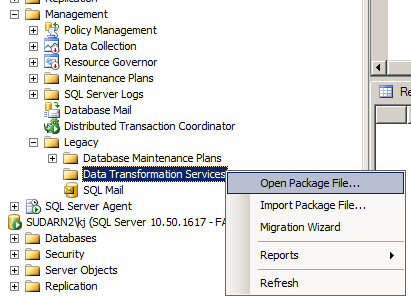 Close and re-open SSMS and you should be able to open the package now. Phew! This was quite a long post indeed but I think I have covered most issues one could run into. If you come across any other issues, leave a comment behind and I will try and see if that can be resolved. As always stay tuned to the TheSQLDude for more….